This page contains my programs for the Sharp Zaurus hand-help PDA computer. They are written with QT/embedded. If you like any of these games or have any comments or bug reports please drop me an email at martin1@heni-online.de so that I can receive some feedback. It would be really nice to receive some emails so that I can get a bit of feedback and develop better programs for you. I am looking forward to your email! Especially, if you discover some bugs please don't hesitate to contact me. It is important to get feedback to improve the programs and know what programs to write in future! Tritoc is a small desktop game for the Zaurus. 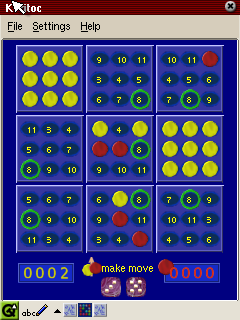 One or two player try to occupy a game board of 9 fields containing 9 holes. 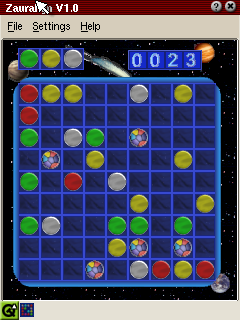 Each of the fields as well as the game itself is won by placing 3 pieces of the same color into one row, coloumn or diagonal (ala Tic-Tac-Toe). However, the places where to place your pieces is determined by dice adding an random luck factor to the game. 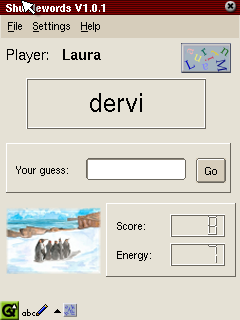 The player in turn throws the dice by clicking on them. If there is a free hole of the dice number the player can place a piece of his/her color into this hole by clicking on the board. If no number is free the dice can be rethrown. However, after three throws the move is over and the next player can move. Also after placing your piece onto the board the next player can throw the dice. There are two special numbers, the 2 and 12. If a 12 is thrown a piece of the opponent can be removed unless it is in a full field. In case of a 2 an own piece has to be removed. To win a field three pieces of the same color need to be placed in any row, column or diagonal. To win the game three fields in any row, column or diagonal need to be occupied by one player. 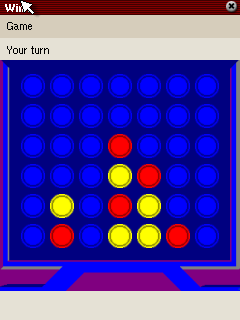 If the game is not won and no more holes are empty or the none of the players could move for four times the game ends drawn. The game is written and compiled with the current QPE/Qtopia version for the Zaurus SL-5000/SL-5500 computer. It probably runs on other handhelds with a compatible configuration, too. You can download here a demo version with some little restrictions. Or to support the development of reasonable priced software consider buying it for only 0.99$ at http://www.handango.com. The program, all code and graphics are copyrighted by M. Heni. This is a one player boardgame for embedded Linux/QT. A bit similar to Tetris in this game you have to keep a game board free, fighting against new pieces appearing every move and clutter the board. You remove pieces by aligning pieces of the same colour in a row, column or diagonal. If you have aligned enough pieces (default: 5) they will vanish making more room on the board. To achieve this you can move any pieces to any location on the board which can be reached by moving the piece on a connected path horizontally or vertically or both. However, for each piece you move new pieces will drop onto the board (default: 3). Only if you manage to align enough pieces so that they vanish no new pieces will appear. You also have a joker piece which can be aligned with any colour. This game originates from an old Russian DOS game Lines and has been ported and adapted as Shareware game to Windows as Align-It and to KDE as Klines This QT version roughly follows the original rules but offers more configuration options, jokers and nice themes. This Roman Gold theme is made on the special request from a colorblind person and is especially suitable for colorblind people! 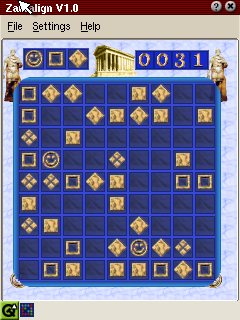 The game is written and compiled with the current QPE/Qtopia version for the Zaurus SL-5000/5500 computer. It probably runs on other handhelds with a compatible configuration, too. If you download the free source archive, information on how to make and install the packages are provided in the README file included in the archives. The binary version can directly be installed on the Zaurus. Use the standard Add/Remove Software mechanism for the package installtion and removal or respectively the ipkg command line tool. The program, all code and graphics are copyrighted by Martin Heni. Source code and graphics are distributed under the GNU GENERAL PUBLIC LICENSE with Version 2, June 1991. Because the program is licensed free of charge, there is no warranty for the program, to the extent permitted by applicable law. Shufflewords is a one or multi player desktop game. The aim of the game is to guess a word from the shuffled letters which are presented to you. Guessing right will reward you with points. Guessing wrong will count your energy down. Is it zero the game is over. Just type the word you guess into the text field via the real or virtual keyboard. Then press enter or the Go button to see your guess. In the Settings menu you can add or delete players and by doing so also change the default name. Highscores are shown in the File menu where you also Start and End a game. You can choose different levels. Easy levels have shorter words then more difficult levels. Information on how to make and install the packages you can find by reading the README file included in the archives. The program, all code and graphics are copyrighted by M. Heni or M. Heni has the right to use them. Source code and graphics are distributed under the GNU GENERAL PUBLIC LICENSE with Version 2, June 1991. This is the Zaurus version of the strategy game Four in a Row" or resp. Connect Four (tm). The objective of the game is for each player to align four pieces of his/her colour in a row, column or diagonal. Win4 is a Zaurus port of my KDE Kwin4 program done by Robert Ernst. It uses the graphics and computer AI from the KWin4 program an the Qtopia UI from Robert Ernst. Source code and graphics are distributed under the GNU GENERAL PUBLIC LICENSE with Version 2, June 1991.